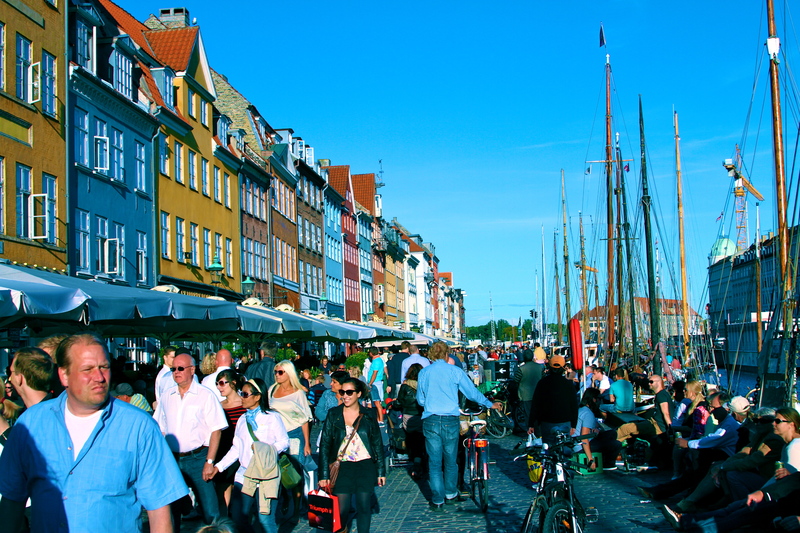 Colorful waterfront at Nyhavn. Pedestrian walking area filled with restaurants. 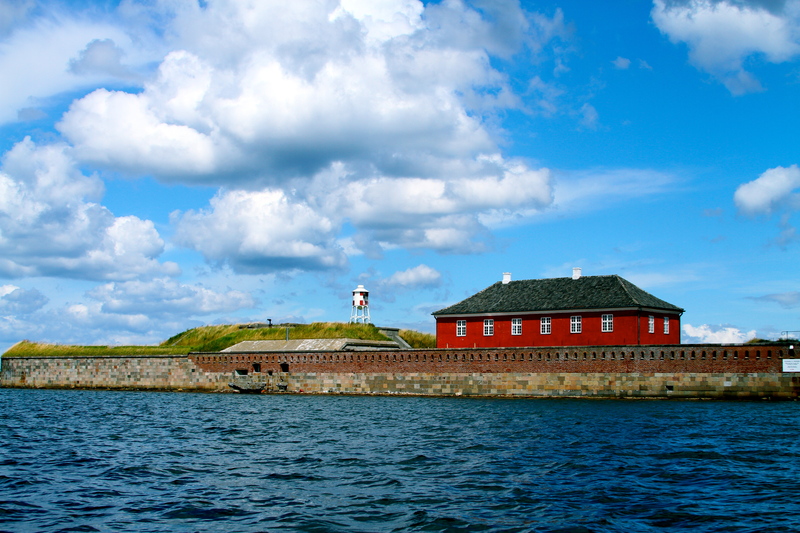 In 2012, my partner and I booked a Baltic cruise with Atlantis Events and spent some extra time in Denmark prior to the cruise and in Sweden after the cruise. Now, I know there has been a lot of recent controversies and issues with cruise lines, but I still think that this is a great way to visit different parts of the world. Especially if combined with some land time either prior to or after the cruise, or both; which is our preferred method. I also feel that it is fair to mention that with a cruise line, you get what you pay for and if you are in a place in life that allows you to book a specialty or niche cruise that is in alignment with who you are or your interests, it may be well worth the extra cost. 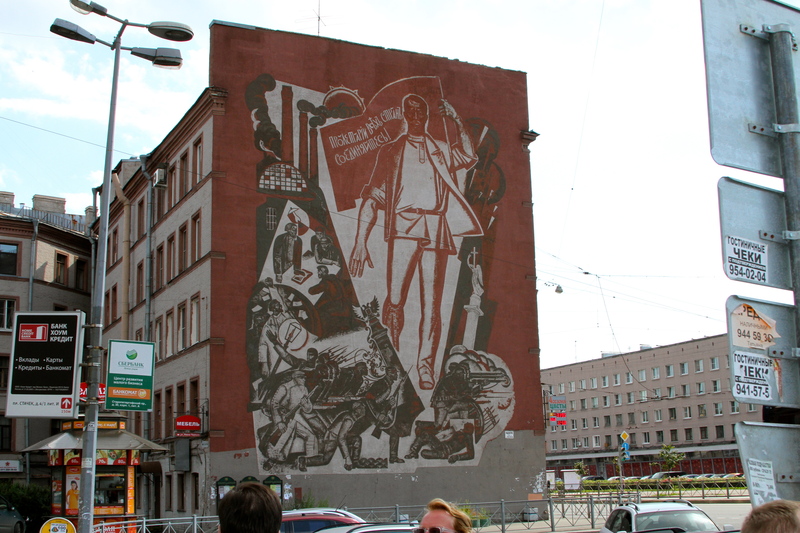 Simply to minimize the length of this blog, I am going to speak to our time in Denmark, Russia and Sweden as these areas were the most memorable for the time we spent. 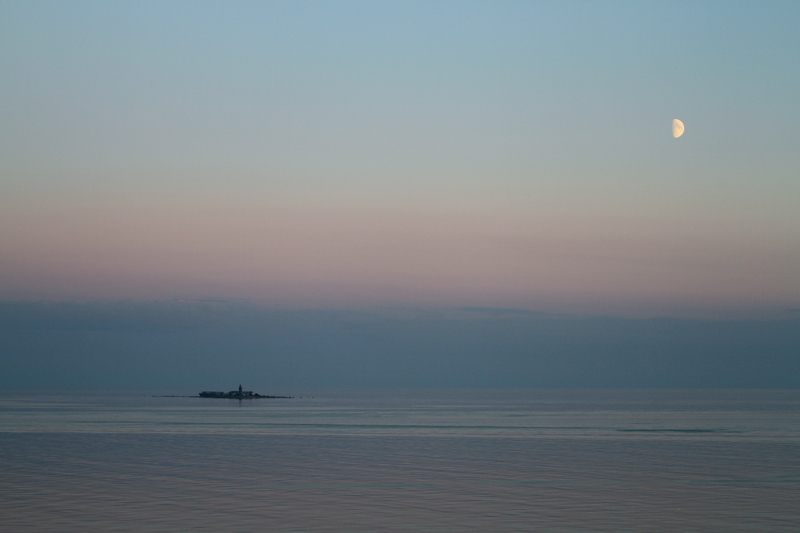 “We live until we die” – Popular saying amongst the Danes. No wonder they are amongst some of the happiest people in the world! 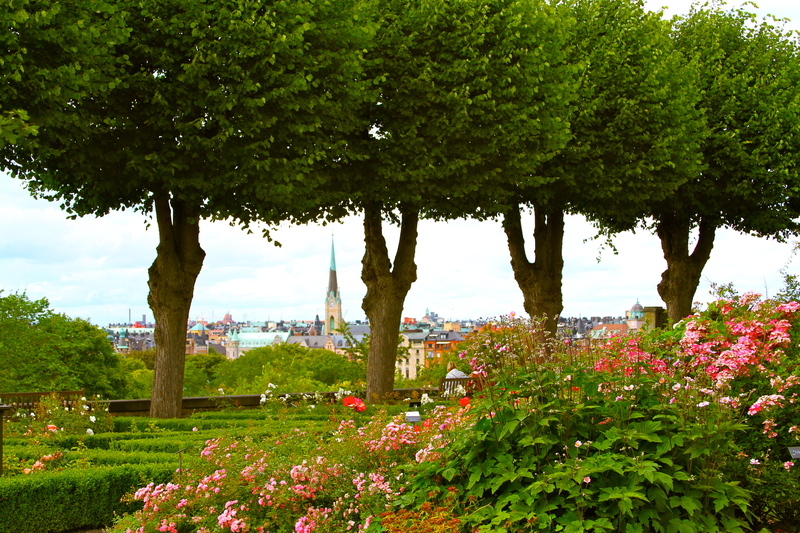 Upon our arrival into Copenhagen, we fell immediately in love with the city. We booked the Admiral Hotel, overlooking the Copenhagen waterfront. The hotel was a great find and it was in a great location. We were in the theatre district and steps from Amalienborg Palace, great shopping, and Nyhavn (see picture above) which was full of great restaurants, shopping and street performers in the afternoon and night. We were about a 10 minute walk to the Stroget, which is the longest car free or pedestrian shopping district in Europe and about a 15-20 minute walk to Tivoli Gardens, which was not a draw for us since we do not have children. On of the very first things that we do in any city this size, is to buy a pass to the “Hop on Hop off” buses. This is a great way to orient yourself with a new city and a very economical means of transportation throughout the city as well, stopping by historical points of interest and popular shopping districts. In Copenhagen, you also have the option to combine your passes with “Hop on Hop off” boats. We also like to be fairly active and sometimes this means renting bikes, but with all the great canals in Copenhagen, we decided to rent kayaks for a day and we explored the city by canal which I highly recommend for anyone with kayaking experience. For those who have never kayaked, not to worry, there are plenty of group kayak tours who provide you with lessons and then tour as a group. Most of our time in Copenhagen was spent walking the city, grabbing trying new foods by grabbing small meals here and there and popping into local pubs and trying local brews and drinks. We also spent a good amount of time seeing the sights via the hop on hop off bus and doing a little shopping/getting design ideas for our house. The Danes have an incredible way to mix fun and function and this is very noticeable in the local independently owned stores. We found more items that we wanted to buy in Denmark than anywhere else but decided against it since it was the first stop of our adventure. Oh well, I guess that just means we’ll need to go back. Don’t you just love a good solution to a problem? We did eat at 2 restaurants that are definitely worth mentioning. 1. Salt. Toldbodgade 24, Copenhagen. Located at the Admiral Hotel. I am not usually a big fan of Hotel Restaurants, but this proved to be an exception. We ate out on the terrace which was perfect as there was limited seating so it was not crowded and had a beautiful and peaceful a view of the waterway with some pedestrian traffic, but just enough for some good people watching. The menu was completely in Danish, so I ordered based on our waiters advice and had an amazing meal. My partner did the same thing and he was raving about his meal as well. There are heat lamps out on the terrace, so at evening descended we stayed comfortable despite the dropping temperatures. 2. Tight. Hyskenstraede 10, Copenhagen. Some friends booked a reservation here, so I had no idea what to expect. the space was very cool with a mixing of contemporary and old world charm. We had a large table on the lower level towards the back and had plenty of space for a group of 8. The food was awesome. This was one of our first meals in Copenhagen, so between everyone at our table, I think we ordered the entire menu and it did not disappoint. The Beef carpaccio was incredible for a starter and I had the duck for my main meal which was just as good. And of course…We had desert. I think we tried everything and I con honestly say that you cannot go wrong but I would encourage you to try something new of that you may not ordinarily order. You won’t be disappointed. After a couple of days in wonderful Copenhagen, we boarded the Holland America Eurodam which was a great ship with brief stops in Warnemunde, Germany and Tallinn, Estonia which then brought us to Saint Petersburg, Russia. Now, I’ll be the first to say that I greatly underestimated what to expect in Saint Petersburg, but WOW. Just WOW. Upon our arrival to Saint Petersburg, it was a very cold first impression. It felt desolate and concrete. And by concrete, I literally mean concrete. There we bunker style concrete apartments everywhere, a throwback to the cold war era. It definitely was not a warming, welcoming site however that soon changed. Now, one thing to keep in mind is that you need to have Visa’s in Russia, even for the day so a group of us booked a private 2 day tour through DenRus tours ahead of time. DenRus also secured day Visa’s for each of the 8 people in our party. Private tours can be spendy, but we more than got our value from having a local navigate us through town and show us the sights, provide us with insight,provide historic content all while keeping us entertained. Our host was AWESOME! 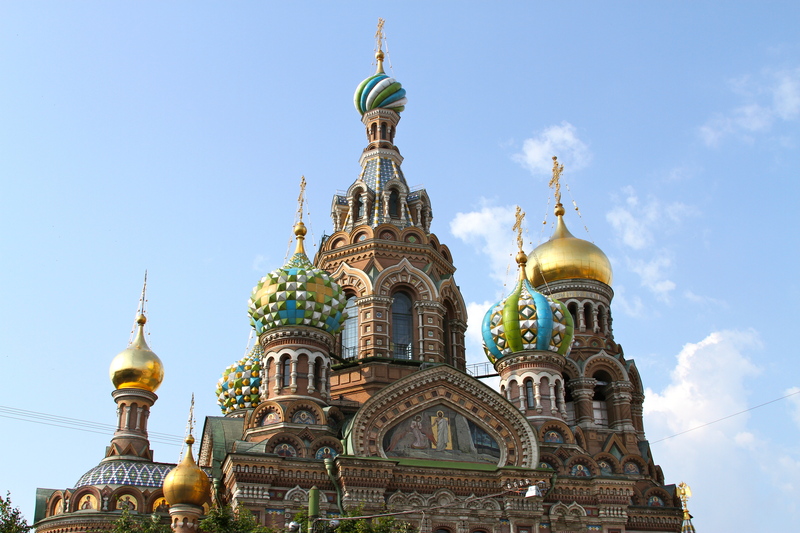 We visited Russian iconic sights such as the Winter Palace, The summer Palace, Peterhof (the palace of Alexander the Great), the Hermitage Museum, the Church of Spilled Blood and many, many more impressive sights. One of the most surprising sights was actually the subway platforms. I know, right? From my understanding, it’s the deepest subway in the world at 105 meters or 345 feet deep. Once we reached the subway platform after a lengthy ride down the escalator, we were blown away at the floor to ceiling marble and the intricate carvings that made up the pillars along the platform to the rows of crystal chandeliers. We rode the subway to the next stop which was just as impressive. That’s one of the amazing things about Saint Petersburg, there is this incredible juxtaposition of cold and warm, grand and humble, excessive and modest. 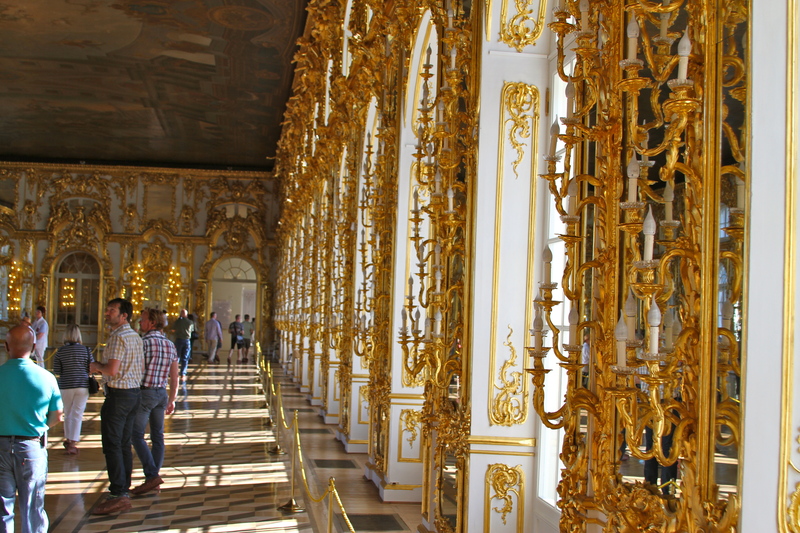 One room at the Winter Palace – Yep, that’s all gold! 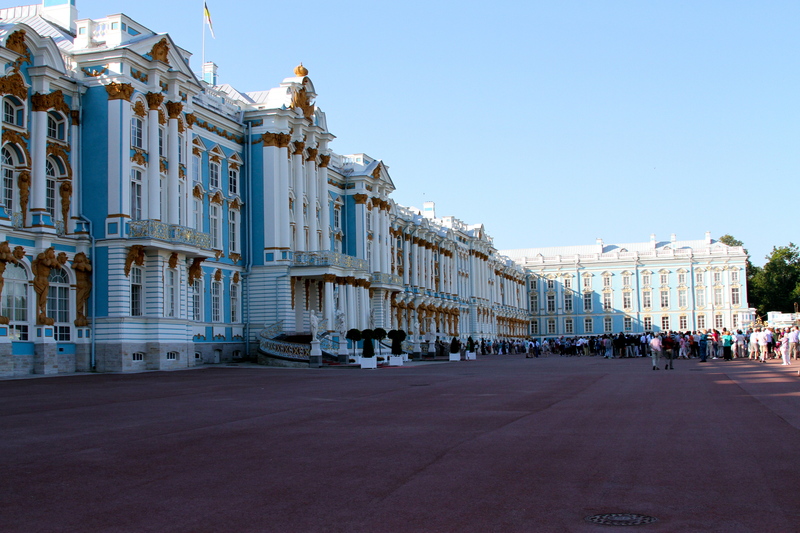 We spent about 4 hours in the Hermitage Museum, which I also learned is the largest Museum in the world and may just house the finest art collection in the world. A person could easily spend several days in the Hermitage and not see everything.The church of Spilled blood is another place that a person could spend a lot of time. As I say that, its fair to say that I am not religious at all, but I do appreciate the symbolism, the history and the artistry. 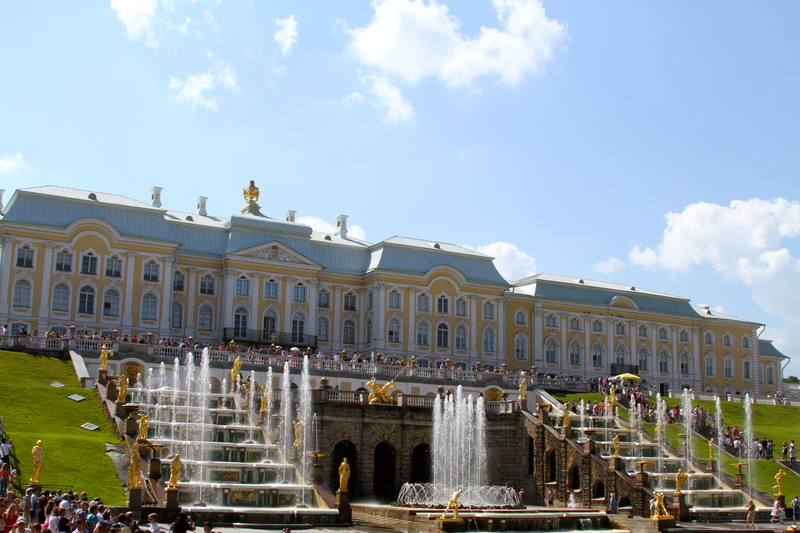 Overall, I found Saint Petersburg to be a beautiful yet intriguing city which I would love to visit again someday. I walked away from Russia with a very new perspective and appreciation. I also walked away with a love for beets and borscht. Who knew? 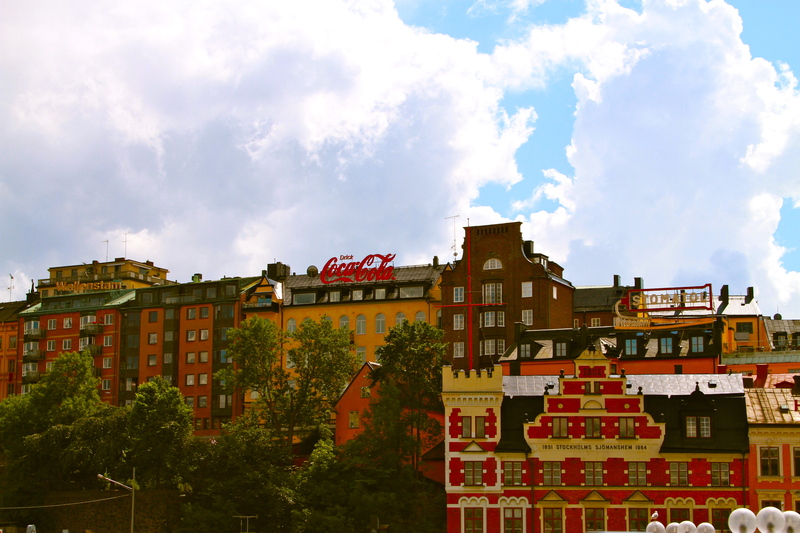 We ended our trip in Sweden, with Stockholm becoming my new favorite city in the world. The city is incredible as it has preserved many of the buildings that would have been destroyed in other European cities during previous wars.The city is very clean and the people, well the people are extremely inviting and honestly look to be about the healthiest and happiest people I have ever seen. People there just had a very healthy glow as well as great style! We stayed at the Nobis Hotel, which is an architectural beauty in itself. It’s possibly the most beautiful hotel that I have stayed at. The staff were all beautiful as well, not that it matters, but it did stand out. And the service was fantastic. The hotel was also ideally located in the higher end shopping district and only blocks away from Gamla Stan, the historic old town of Stockholm. The streets around the hotel were filled with shoppes and sidewalk eateries and bars, all of which had fantastic food. Something to know about me…. I love food! No, I mean I really love good food so it’s rare that I would say what I am about to say. I don’t know that you can really go wrong in Stockholm whan it comes to great food. Sure there are going to be one offs, but it’s such a hot spot on the world menu right now that the great food visionaries have pretty much won out all over Stockholm. I say this so that you don’t make the same mistake that we did as we waited for hours for a highly rated restaurant and ended up walking somewhere less highly rated only to have an amazing and much less expensive meal. 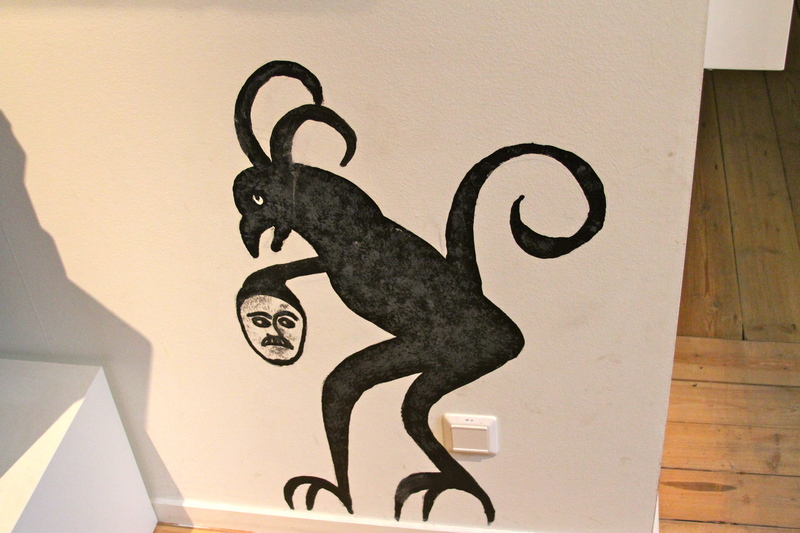 Some of our best meals were lunches at small sidewalk bistros and dinners at small terrace restaurants in Gamla Stan. Similar to what I mentioned about Copenhagen, I recommend buying passes to the “Hop on Hop off” bus to see some sights and become quickly oriented with the city itself. 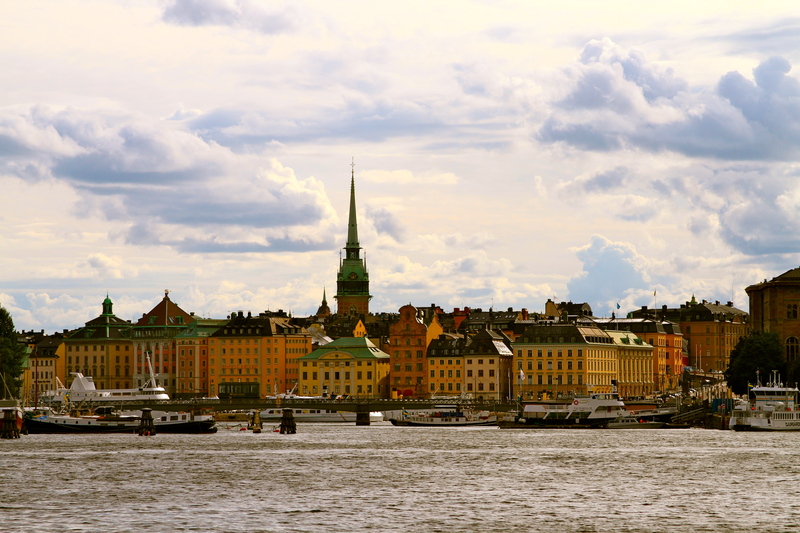 Stockholm, also similar to Copenhagen, is an extremely walkable and bike-able city. We literally walked just about everywhere and did not even come close to doing all of our “to-do’s”. Although I would rather miss some things and have a great time than try to do everything just to say that I did. I look at it as another opportunity to go back for another visit. Next time we WILL make it to the Ice bar! Which sounds silly due to the fact that we live in Minnesota, which is colder than Sweden. Oh well…I would recommend taking the time to visit the Nordiska Museet or Nordic Museum and the Vasamuseet or Vasa Museum. The Vasa Museum is unique in that the entire museum is built around a war ship that was almost perfectly preserved in the Baltic silt when it sank during its maiden voyage back in the 1600s. Close by is the Skansen open-air museum which is a great way to spend a chunk of your day, especially if the wether is nice. I also feel that I should mention that the train system throughout Scandinavia is super easy to use, and it’s often worth it to pay the little extra for 1st class. We took the high speed train from Stockholm to Gothenburg and had free WI-fi and ample leg room and storage. The train is a super easy and comfortable journey, and I am 6’3″, so I often am a little less than comfortable when traveling mass-transit. I would also recommend taking a train, even if you do not have a particular destination, just to see the rural countryside and other parts of the country. Take an overnight train across the country. Sleep on the train and then you have all day to explore before you take an overnight train back. It was gorgeous and worth the train ride just for the sights! As always, thank you for reading and feel free to leave comments or suggestions for others. This entry was posted in Uncategorized and tagged Alexander the Great, Church of the Savior on Blood, Copenhagen, Denmark, Hermitage Museum, Nyhavn, Russia, Saint Petersburg, Strøget, sweden, Tallinn, Tivoli Gardens, Winter Palace. Bookmark the permalink.